Ottawa to set up new long pig registry? Have you registered your pig yet? Click image to go to source. “According to a mail-out from Agriculture Canada and the government of Yukon, Canadians are now required to register their pigs. Under the National Agriculture and Food Traceability program, all pigs must be registered, for safety purposes. They’re kidding right? This can’t possibly be the Harper government at work. Surely the champions of freedom who are in the process of dismantling the odious gun registry aren’t about to replace it with a pig registry? The Nordicity research team has been working on this day and night, and we have uncovered some shocking truths. For instance, pet pot-belly pigs, which are short as well as stout, are exempt from the registry. Which means, of course, that Canada is embarked upon a national long-pig registry. Oh, fools, fools! Will they never learn? Once again the government is bent on making criminals out of ordinary law-abiding farmers. 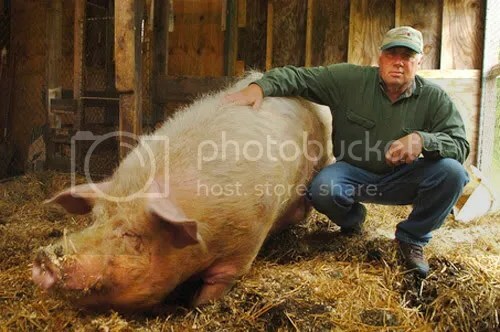 Don’t they know our pigs are tools, not weapons, that we have generations of experience in handling pigs safely, and a long lawful tradition of responsible pig ownership? Farmers grew up in an environment where pigs were a normal part of life, everybody had one and nobody thought anything of them, until they needed a Thanksgiving ham or a rasher of breakfast bacon. The registry is only part of the picture. Our researchers have uncovered persistent rumours that farmers will be required to carry a pig licence, take a pig safety course, and comply with arcane and inconvenient pig-storage laws. In all likelihood we’ll be forced to keep the pig feed in a separate place from the pigs. According to our sources, farmers wishing to acquire new pigs will require a PAC, or pig acquisition certificate, issued by the government. Is this the Canada our fathers fought and died for? Read it all on the Yukon News. Apparently this article also appears on the back page of Jan/Feb 2012 Small Farm Canada. Can this be for real? Uhm, April 1 is four months away! This cannot be for real. But, then there are a lot of things these days that absolutely boggle the mind. For instance one day a long time ago it was decided that raw milk is a deadly substance. Someone of questionable sanity decided it MUST be pasturized to be made safe. So here we are in 2012 and with criminalization and government raids of raw milk producers. And, now God forbid that a farmer should one day have an unregistered pig.